At Riverheart Family Dentistry, we don't let your busy schedule stand in the way of helping you achieve your best smile. Whether you are a student, working professional or parent of multiple kids, our dentist office in O'Fallon is equipped to accommodate your schedule demands. We are a family dental practice that is led by an exceptionally skilled and gentle dentist, Dr. Travis Schwarz. 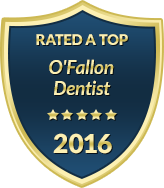 Our practice provides top quality general, restorative and cosmetic dental services in an environment that feels like home. At Riverheart Family Dentistry, we understand your scheduling needs. Therefore, our staff is available during extended weekday hours, and we also offer family block appointments to make your dental care as stress-free as possible. We Offer Early & Late Appointments! Many of our patients choose to schedule their dental cleaning or other procedures before school or after work. Riverheart Family Dentistry proudly sees patients during early morning or late evening appointment times. We do not want our patients to sacrifice their workday or other timely matters to get the attention their smile needs and deserves. Our office makes a strong effort to keep our appointments running on time and we use the latest in dental technology to ensure your procedures are carried out with maximum efficiency and comfort. We carry the unique ability to treat every member of your family at Riverheart Family Dentistry. To ensure your hassle is low and your convenience is high, we gladly arrange for family block appointments upon request. Instead of shuttling your children back and forth to the dental office or trying to keep up with who is due for a six-month dental exam, we can see your entire family on the same day. Our flexible appointment times are just one of the many ways that we provide exceptional dental care to patients in O'Fallon and the surrounding area. Riverheart Family Dentistry believes in providing the highest quality dental services with a strong emphasis on patient comfort. We provide patient amenities ranging from a children's play area to operatory TV's and complimentary beverages. We also offer sedation dentistry when needed. At Riverheart Family Dentistry, we go out of our way to put your needs first. When it comes to scheduling your appointment, let us know what time is most convenient for you. Our staff is always ready to care for your smile. Contact our office today to make an appointment for you or a family member.